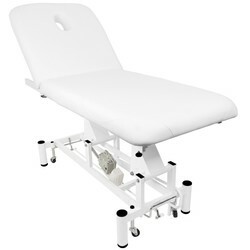 Electric massage couch with 1 engine. Treatment couch with good comfort. Equipped with 1 engine, so that the height is adjusted electrically. The back part can be manually controlled. Headrest cushion and vent hole. Metal frame, curved bottom with retractable wheels for easy movement.